Notes: [acquired-Alexandre]Printed for Rob.t Sayer. Map & Printseller, No. 53 in Fleet Street, as the Act directs 20 Feb.y 1775. The spatial scale is estimated based on the kilometers present on a degree of latitude close to the Tropic of Cancer. 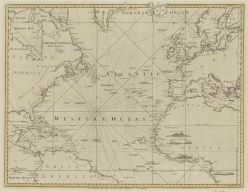 The map has rhumb lines in the ocean and elevation cross sections sketches in the African continent.